Cate Blanchett IS Bob Dylan. There is no other explanation. I don't typically rate films that I don't view in their entirety, but this one was impossible for me to finish, and it's worth noting so I don't accidentally take another chance on this. Oren Moverman is one of my absolute favorite writers, so I tried my hardest to give it a fair chance, but it's just not for me. I wouldn't say it's bad, just boring. I may just be just too stupid to find it entertaining. I also have zero interest in the life of Bob Dylan. Too much vignette, too little acting. First of all, Cate Blanchett (Jude) was fantastic in this film. Todd Haynes gets quite experimental with the narrative structure of this film. 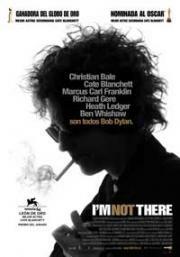 While all based on Bob Dylan, he breaks different parts of Dylan's life into literally different characters. Some of these characters get a lot more screen time and more importance than others, which works with Blanchett and not so much for Richard Gere (Billy). The film is an ambitious, albeit a bit meandering, portrayal of an oft ambiguous artist.